This is one of the many examples of why we MUST ban declawing and why WE must educate the public about the FACTS and TRUTH about declawing since most declawing vets are deceiving the public about it. 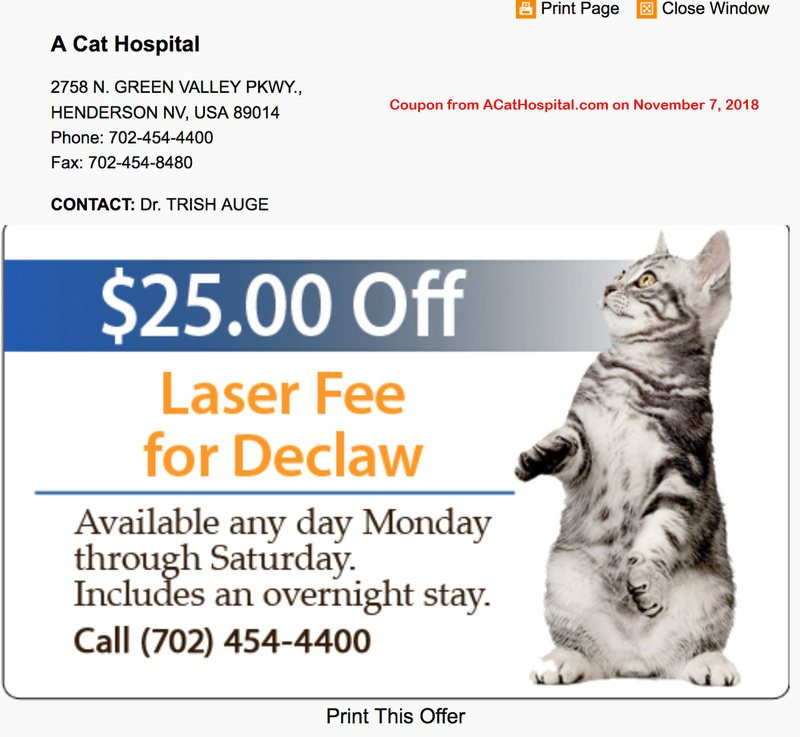 A Cat Hospital in Henderson, Nevada is BLATANTLY lying about the facts about declawing on their website. 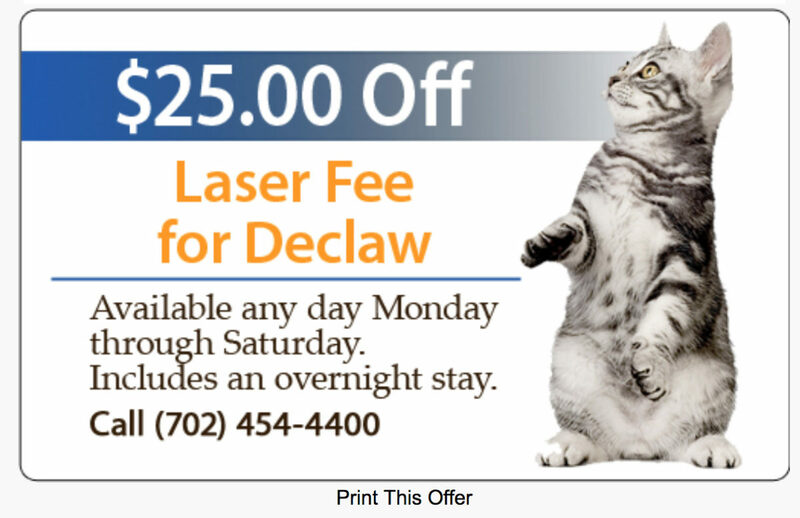 They are also offering this coupon on their website for their laser declaw. Dr. Trish Auge is the Veterinarian & Owner of A Cat Hospital. There are two other vets who work there. They all perform declaws. I reached out to her to ask her some questions about her declawing info but she never got back with me. FACT- Cats walk on the joint between the P2 and P3 and they need the P3 bone which is what the claw grows from for balance and weight distribution. FACT- Declawing is an amputation procedure that always harms the health and well-being of a cat. I had my researchers look into how A Cat Hospital addresses declawing by posing as a first time cat owner and calling for a price for a neuter and declaw. Here’s what they found. The researcher asked if they use a laser for the declaw and the employee said they do a “regular” way and the laser and the laser fee is $97 on top of the $285. Cat declawing can be a controversial procedure, and as such, it is important to have the facts so you can make the best decision for your cat. Cat declawing is a surgical procedure by which vets remove the cat’s claw and the part of the toe bone out of which the claw grows. If the tiny piece of bone at the end of the cat’s toe is not removed, the claw could try to grow back, causing complications. The cat declaw procedure is typically performed to correct behavior problems involving scratching of furniture or people. The vets at A Cat Hospital recommend keeping declawed cats indoors. A cat’s toe is not like a dog’s or human’s toe. The pad of the toe is similar to the middle section of the human finger. At the end of the cat’s toe is a small bone and out of that bone grows the cat’s claw. The retracted claw and bone, which are not used for walking and touching, are typically hidden beneath the cat’s fur. Cats scratch in order to sharpen their claws, stretch their bodies, and exercise their muscles. When a cat that has not been declawed scratches, it pulls off the outer layer of its claw, leaving the new, sharper growth behind. While many owners depend on trimming a cat’s claws to prevent scratch injuries to members of the household or to try and mitigate damage to furniture, trimming a cat’s claws often only makes it want to scratch more, to re-sharpen its claws. While some cats can be trained not to scratch furniture, other cats cannot. Cat declawing may be the only way to keep the cat from damaging furniture. Most vets will agree that declawing a cat is definitely preferable to surrendering that cat to an animal shelter, where it has about a 90 percent chance of being euthanized after it fails to find a new home. Declawing a cat is also preferable to making a furniture-scratching cat into an outdoor-only cat; an indoor cat with claws are often unfortunately thrown outside. The declawed indoor cat will be protected from dogs, cat fights, car injuries, nor will it experience cold, extreme heat or loneliness. In addition, declawed indoor cats will not be exposed to contagious diseases that outdoor cats encounter. Cats with Arthritis and aging cats commonly have nails that are growing into their pads. This can cause quite a bit of pain for your cats in which that pain can translate into other areas of their daily activities, such as when walking , or using scratching posts. During a cat declaw, veterinarians remove only the claw and the tip of the bone from which the claw grows. The entire pad of the toe is left intact, to speed recovery. When the cat declaw procedure is performed in this way, the surgical wounds heal rapidly, and the cat is able to walk comfortably again within about a week. The cat does not need its claws for walking, running, playing, jumping, or climbing. Cats use their claws only for scratching. “Should You Declaw Your Cat? There are people on both sides of the declawing debate, so in order to determine whether you want your cat declawed, it is important to have the facts. During declawing, only the part of the toe that retracts over the claw, and only the part of the bone associated with the claw are removed. Cats’ toes are very different from those on humans or dogs, and the part of the toe that is removed is not used by the cat for walking or touching. It is only used for scratching. Cats’ claws can be powerful and used to catch prey and defend themselves. House cats generally do not need to do these things, but can easily scratch and damage carpets and furniture. Is Trimming the Claws Enough? Being aware of how the process is handled can help you make a decision about declawing your cat. Additionally, it is important to know that cats can get arthritis in their joints, just like people and other animals. When that happens, it is more difficult for the cat to remove the claw sheaths that need to come off as the claws grow. That can mean claws that are too long, and that grow into the pad of the foot, which can be very painful. Trimming your cats’ nails is recommended if you choose not to declaw, but many cats really dislike having their nails trimmed. Because cats often fight having their claws trimmed, and because it is not possible for everyone to bring their cats to the vet to have those trims done on a regular basis, people can end up having difficulty coexisting peacefully with their cats. That can cause problems for the cats and their owners, and is among the reasons that cats are handed over to shelters. Cats need proper care, and if they have issues that make living with them difficult, there are often things that can be done to help keep the peace in the household. Declawing may be on that list for many people. How Does Declawing Change a Cat’s Behavior? Having a cat declawed is not going to change the behavior of the cat. The cat may be a little careful with its feet until it heals from the procedure, but that is a temporary thing. After that, they will run, jump, play, and do all the things they used to do before they were declawed. Cats that are declawed are not turned over to shelters more than cats that still have their claws, and they do not suffer from higher levels of behavioral problems. Please remember to always take the high road and never threaten or be mean. When you are mean, it hurts the cause and it’s wrong. Please educate and inspire. 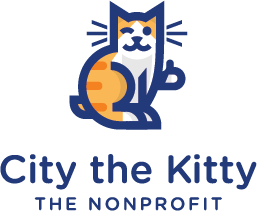 If you want to be a City the Kitty Crusader volunteer for my NEW nonprofit, please send me an email to citythekitty@gmail.com and put your state in the subject line. Also please read my Strategic Plan that’s on the home page of my website and if you have any other ideas on how we can educate the public about the awful truth about declawing and about the EASY, humane options, let me know!